Wing span: 1 1/2 - 2 7/16 inches (3.8 - 6.2 cm). Identification: Upperside is light to medium brown with black eyespots. Underside of forewing has submarginal eyespots about the same size, usually touching or linked like a chain; dark line inside the hindwing's spot row is zigzagged. Life history: The Eyed Brown flies weakly over and within low plant growth and perches frequently. Males patrol in vegetation and occasionally perch to court females. Eggs are scattered on many different plants. Caterpillars eat leaves; the third and fourth stages hibernate. Caterpillar hosts: Various sedges (Carex stricta, C. lupulina, C. bromoides, and C. trichocarpa) in the sedge family (Cyperaceae). Adult food: Sap, bird droppings, and occasionally flower nectar. Habitat: Open sedge meadows, freshwater marshes, slow-moving streams, cord grass swales in tallgrass prairie. Range: Eastern North America from Nova Scotia south to Delaware and west to Saskatchewan and eastern Nebraska. Outlying populations in north-central Colorado, east-central Alberta, and northern Quebec. 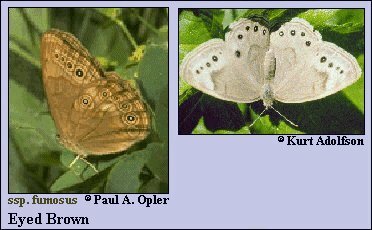 Conservation: Smoky Eyed Brown (subspecies fumosus) is of concern in several states. It has The Nature Conservancy Global Rank of G3 - Very rare or local throughout its range or found locally in a restricted range (21 to 100 occurrences). (Threatened throughout its range). Management needs: Monitor populations of subspecies fumosus and make conservation recommendations. Other subspecies have The Nature Conservancy Global Rank of G5 - Demonstrably secure globally, though it may be quite rare in parts of its range, especially at the periphery. Note: Subspecies fumosus has been considered a separate species in the past.